Friday 6 1/2 inches of snow fell. It's the most snow we've had this winter, which is a little disappointing. I figure if it's going to be cold it might as well SNOW so we can have fun. 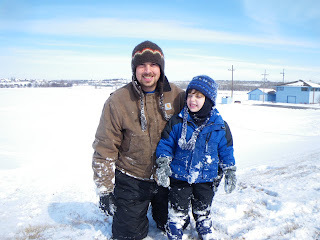 Saturday and Today we went sledding and Ben just loves it. Today I took a fall from the sled.. (my fault I was leaning).. and Ben told me next time it was my turn that he would go with me to show me how to do it without falling. He instructed me all the way down the hill.. and then where to walk going back up. Did you make those hats for them???? ?